Park and colleagues demonstrate an essential role for the transcription factor ETV1 in controlling fast conduction in the heart. The cover image shows expression of Etv1-nlz (blue) reporter genes within specialized fast conduction fibers of the ventricular conduction system, labeled with Cntn2-EGFP (green). Image credit: Akshay Shekhar. Citation Information: J Clin Invest. 2016;126(12):4391-4392. https://doi.org/10.1172/JCI91072. Citation Information: J Clin Invest. 2016;126(12):4393-4395. https://doi.org/10.1172/JCI91277. Cognitive impairment, an underappreciated consequence of hypertension, is linked to cerebral arteriolar disease through poorly defined mechanisms. A study by Faraco et al. in this issue of the JCI points to perturbations of neurovascular unit coupling caused by perivascular macrophages (PVMs) as a cause of hypertension-related cognitive impairment. Angiotensin II (Ang II) was shown to activate PVMs, causing them to produce superoxide and thereby alter the proper functioning of the adjacent arterioles. Faraco and colleagues also show that disruption of the blood-brain barrier occurs in hypertension, allowing circulating Ang II to access PVMs. This study provides important new insight into the role of inflammatory cells in the genesis of vascular dementia. Citation Information: J Clin Invest. 2016;126(12):4396-4398. https://doi.org/10.1172/JCI91300. Preeclampsia is a common complication of pregnancy that is associated with an increased risk of maternal and neonatal morbidity and mortality. Currently, delivery is the only cure for preeclampsia; therefore, effective prevention and treatment options for this condition are sorely needed. In the current issue of the JCI, Mirzakhani et al. report the findings of the Vitamin D Antenatal Asthma Reduction Trial (VDAART), a well-conducted large, randomized, double-blind, placebo-controlled trial of vitamin D supplementation for the prevention of preeclampsia. Though vitamin D supplementation had no effect on the risk of preeclampsia, reduced maternal serum vitamin D levels did correlate with preeclampsia risk. Mirzakhani and colleagues identified a number of gene pathways that are differentially regulated among women with low serum vitamin D levels who develop preeclampsia. These results indicate that further research on the role of vitamin D in preeclampsia is warranted. Citation Information: J Clin Invest. 2016;126(12):4399-4401. https://doi.org/10.1172/JCI91302. CD8+ T cells play a central role in eradicating intracellular pathogens, but also are important for noninfectious diseases, including cancer and autoimmunity. The ability to clinically manipulate CD8+ T cells to target cancer and autoimmune disease is limited by our ignorance of relevant self-peptide target antigens. 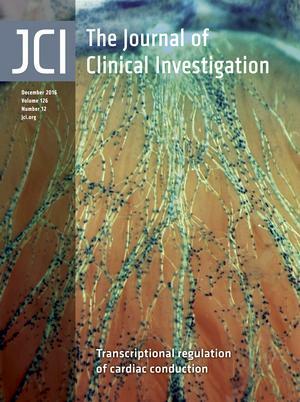 In this issue of the JCI, Pearson et al. describe 25,270 MHC class I–associated peptides presented by a wide range of HLA A and B allomorphs expressed by 18 different B cell lines. Via extensive bioinformatic analysis, the authors make surprising conclusions regarding the selective nature of peptide generation at the level of individual gene products and create a predictive algorithm for disease-relevant self-peptides that will be of immediate use for clinical and basic immunological research. Citation Information: J Clin Invest. 2016;126(12):4402-4403. https://doi.org/10.1172/JCI91303. Nitric oxide (NO) is a potent mediator of blood vessel dilation and is released by several cell sources. Red blood cells (rbc) release NO when hemoglobin that has been S-nitrosylated at Cys93 of the β-chain (βCys93) transitions from the oxygenated form to the deoxygenated form. This transition occurs in response to reduced tissue oxygenation and is an important physiologic regulator of hypoxic vasodilation. In this issue of the JCI, Zhang and colleagues demonstrate that S-nitrosylation of hemoglobin at βCys93 is important for tissue oxygenation after cardiac injury. Mice harboring mutations that prevent S-nitrosylation of βCys93 had higher rates of morbidity and mortality following cardiac injury compared with WT; however, adaptive cardiac vascularization was increased in some mutant mice and reduced cardiac injury in these animals. The results of this study reveal a previously unexplored role of S-nitrosylated hemoglobin in cardioprotection. Citation Information: J Clin Invest. 2016;126(12):4404-4416. https://doi.org/10.1172/JCI85413. Natural killer (NK) cells can have potent antileukemic activity following haplo-mismatched, T cell–depleted stem cell transplantations for the treatment of acute myeloid leukemia (AML), but they are not successful in eradicating de novo AML. Here, we have used a mouse model of de novo AML to elucidate the mechanisms by which AML evades NK cell surveillance. NK cells in leukemic mice displayed a marked reduction in the cytolytic granules perforin and granzyme B. Further, as AML progressed, we noted the selective loss of an immature subset of NK cells in leukemic mice and in AML patients. This absence was not due to elimination by cell death or selective reduction in proliferation, but rather to the result of a block in NK cell differentiation. Indeed, NK cells from leukemic mice and humans with AML showed lower levels of TBET and EOMES, transcription factors that are critical for terminal NK cell differentiation. Further, the microRNA miR-29b, a regulator of T-bet and EOMES, was elevated in leukemic NK cells. Finally, deletion of miR-29b in NK cells reversed the depletion of this NK cell subset in leukemic mice. These results indicate that leukemic evasion of NK cell surveillance occurs through miR-mediated dysregulation of lymphocyte development, representing an additional mechanism of immune escape in cancer. Citation Information: J Clin Invest. 2016;126(12):4417-4429. https://doi.org/10.1172/JCI85705. The rising success of cancer immunotherapy has produced immense interest in defining the clinical contexts that may benefit from this therapeutic approach. To this end, there is a need to ascertain how the therapeutic modulation of intrinsic cancer cell programs influences the anticancer immune response. For example, the role of autophagy as a tumor cell survival and metabolic fitness pathway is being therapeutically targeted in ongoing clinical trials that combine cancer therapies with antimalarial drugs for the treatment of a broad spectrum of cancers, many of which will likely benefit from immunotherapy. However, our current understanding of the interplay between autophagy and the immune response remains incomplete. Here, we have evaluated how autophagy inhibition impacts the antitumor immune response in immune-competent mouse models of melanoma and mammary cancer. We observed equivalent levels of T cell infiltration and function within autophagy-competent and -deficient tumors, even upon treatment with the anthracycline chemotherapeutic doxorubicin. Similarly, we found equivalent T cell responses upon systemic treatment of tumor-bearing mice with antimalarial drugs. Our findings demonstrate that antitumor adaptive immunity is not adversely impaired by autophagy inhibition in these models, allowing for the future possibility of combining autophagy inhibitors with immunotherapy in certain clinical contexts. Citation Information: J Clin Invest. 2016;126(12):4430-4443. https://doi.org/10.1172/JCI86674. Citation Information: J Clin Invest. 2016;126(12):4444-4459. https://doi.org/10.1172/JCI87968. Citation Information: J Clin Invest. 2016;126(12):4460-4468. https://doi.org/10.1172/JCI88152. Interactions between multiple myeloma (MM) cells and the BM microenvironment play a critical role in bortezomib (BTZ) resistance. However, the mechanisms involved in these interactions are not completely understood. We previously showed that expression of CYP26 in BM stromal cells maintains a retinoic acid–low (RA-low) microenvironment that prevents the differentiation of normal and malignant hematopoietic cells. Since a low secretory B cell phenotype is associated with BTZ resistance in MM and retinoid signaling promotes plasma cell differentiation and Ig production, we investigated whether stromal expression of the cytochrome P450 monooxygenase CYP26 modulates BTZ sensitivity in the BM niche. CYP26-mediated inactivation of RA within the BM microenvironment prevented plasma cell differentiation and promoted a B cell–like, BTZ-resistant phenotype in human MM cells that were cocultured on BM stroma. Moreover, paracrine Hedgehog secretion by MM cells upregulated stromal CYP26 and further reinforced a protective microenvironment. These results suggest that crosstalk between Hedgehog and retinoid signaling modulates BTZ sensitivity in the BM niche. Targeting these pathological interactions holds promise for eliminating minimal residual disease in MM. Citation Information: J Clin Invest. 2016;126(12):4482-4496. https://doi.org/10.1172/JCI87802. Cellular identity in metazoan organisms is frequently established through lineage-specifying transcription factors, which control their own expression through transcriptional positive feedback, while antagonizing the developmental networks of competing lineages. Here, we have uncovered a distinct positive feedback loop that arises from the reciprocal stabilization of the tyrosine kinase ABL and the transcriptional coactivator TAZ. Moreover, we determined that this loop is required for osteoblast differentiation and embryonic skeletal formation. ABL potentiated the assembly and activation of the RUNX2-TAZ master transcription factor complex that is required for osteoblastogenesis, while antagonizing PPARγ-mediated adipogenesis. ABL also enhanced TAZ nuclear localization and the formation of the TAZ-TEAD complex that is required for osteoblast expansion. Last, we have provided genetic data showing that regulation of the ABL-TAZ amplification loop lies downstream of the adaptor protein 3BP2, which is mutated in the craniofacial dysmorphia syndrome cherubism. Our study demonstrates an interplay between ABL and TAZ that controls the mesenchymal maturation program toward the osteoblast lineage and is mechanistically distinct from the established model of lineage-specific maturation. Citation Information: J Clin Invest. 2016;126(12):4497-4515. https://doi.org/10.1172/JCI86359. Citation Information: J Clin Invest. 2016;126(12):4516-4526. https://doi.org/10.1172/JCI88170. Citation Information: J Clin Invest. 2016;126(12):4527-4536. https://doi.org/10.1172/JCI87343. Arterial blood pressure is controlled by vasodilatory factors such as nitric oxide (NO) that are released from the endothelium under the influence of fluid shear stress exerted by flowing blood. Flow-induced endothelial release of ATP and subsequent activation of Gq/G11–coupled purinergic P2Y2 receptors have been shown to mediate fluid shear stress–induced stimulation of NO formation. However, the mechanism by which fluid shear stress initiates these processes is unclear. Here, we have shown that the endothelial mechanosensitive cation channel PIEZO1 is required for flow-induced ATP release and subsequent P2Y2/Gq/G11–mediated activation of downstream signaling that results in phosphorylation and activation of AKT and endothelial NOS. We also demonstrated that PIEZO1-dependent ATP release is mediated in part by pannexin channels. The PIEZO1 activator Yoda1 mimicked the effect of fluid shear stress on endothelial cells and induced vasorelaxation in a PIEZO1-dependent manner. Furthermore, mice with induced endothelium-specific PIEZO1 deficiency lost the ability to induce NO formation and vasodilation in response to flow and consequently developed hypertension. Together, our data demonstrate that PIEZO1 is required for the regulation of NO formation, vascular tone, and blood pressure. Citation Information: J Clin Invest. 2016;126(12):4537-4553. https://doi.org/10.1172/JCI87105. Certain secretory proteins are known to be critical for maintaining the stemness of stem cells through autocrine signaling. However, the processes underlying the biogenesis, maturation, and secretion of these proteins remain largely unknown. Here we demonstrate that many secretory proteins produced by hematopoietic stem cells (HSCs) undergo exosomal maturation and release that is controlled by vacuolar protein sorting protein 33b (VPS33B). Deletion of VPS33B in either mouse or human HSCs resulted in impaired exosome maturation and secretion as well as loss of stemness. Additionally, VPS33B deficiency led to a dramatic delay in leukemogenesis. Exosomes purified from either conditioned medium or human plasma could partially rescue the defects of HSCs and leukemia-initiating cells (LICs). VPS33B co-existed in exosomes with GDI2, VPS16B, FLOT1, and other known exosome markers. Mechanistically, VPS33B interacted with the GDI2/RAB11A/RAB27A pathway to regulate the trafficking of secretory proteins as exosomes. These findings reveal an essential role for VPS33B in exosome pathways in HSCs and LICs. Moreover, they shed light on the understanding of vesicle trafficking in other stem cells and on the development of improved strategies for cancer treatment. Citation Information: J Clin Invest. 2016;126(12):4554-4568. https://doi.org/10.1172/JCI87848. Citation Information: J Clin Invest. 2016;126(12):4569-4584. https://doi.org/10.1172/JCI86489. Current chemotherapies for T cell acute lymphoblastic leukemia (T-ALL) efficiently reduce tumor mass. Nonetheless, disease relapse attributed to survival of preleukemic stem cells (pre-LSCs) is associated with poor prognosis. Herein, we provide direct evidence that pre-LSCs are much less chemosensitive to existing chemotherapy drugs than leukemic blasts because of a distinctive lower proliferative state. Improving therapies for T-ALL requires the development of strategies to target pre-LSCs that are absolutely dependent on their microenvironment. Therefore, we designed a robust protocol for high-throughput screening of compounds that target primary pre-LSCs maintained in a niche-like environment, on stromal cells that were engineered for optimal NOTCH1 activation. The multiparametric readout takes into account the intrinsic complexity of primary cells in order to specifically monitor pre-LSCs, which were induced here by the SCL/TAL1 and LMO1 oncogenes. We screened a targeted library of compounds and determined that the estrogen derivative 2-methoxyestradiol (2-ME2) disrupted both cell-autonomous and non–cell-autonomous pathways. Specifically, 2-ME2 abrogated pre-LSC viability and self-renewal activity in vivo by inhibiting translation of MYC, a downstream effector of NOTCH1, and preventing SCL/TAL1 activity. In contrast, normal hematopoietic stem/progenitor cells remained functional. These results illustrate how recapitulating tissue-like properties of primary cells in high-throughput screening is a promising avenue for innovation in cancer chemotherapy. Citation Information: J Clin Invest. 2016;126(12):4585-4602. https://doi.org/10.1172/JCI86505. Mutations and deletions in components of ubiquitin ligase complexes that lead to alterations in protein turnover are important mechanisms in driving tumorigenesis. Here we describe an alternative mechanism involving upregulation of the microRNA miR-424 that leads to impaired ubiquitination and degradation of oncogenic transcription factors in prostate cancers. We found that miR-424 targets the E3 ubiquitin ligase COP1 and identified STAT3 as a key substrate of COP1 in promoting tumorigenic and cancer stem-like properties in prostate epithelial cells. Altered protein turnover due to impaired COP1 function led to accumulation and enhanced basal and cytokine-induced activity of STAT3. We further determined that loss of the ETS factor ESE3/EHF is the initial event that triggers the deregulation of the miR-424/COP1/STAT3 axis. COP1 silencing and STAT3 activation were effectively reverted by blocking of miR-424, suggesting a possible strategy to attack this key node of tumorigenesis in ESE3/EHF–deficient tumors. These results establish miR-424 as an oncogenic effector linked to noncanonical activation of STAT3 and as a potential therapeutic target. Citation Information: J Clin Invest. 2016;126(12):4603-4615. https://doi.org/10.1172/JCI87081. The transcription factor NR4A3 (also known as NOR-1) is a member of the Nr4a family of nuclear receptors and is expressed in myeloid and lymphoid cells. Here, we have shown that Nr4a3 is essential for the migration of CD103+ dendritic cells (DCs) to lymph nodes (LNs). Nr4a3-deficient mice had very few CD103+ migratory DCs (mDCs) present in LNs, and mixed-chimera studies revealed that this migratory defect was cell intrinsic. We further found that CD103+ DCs from Nr4a3-deficient mice displayed a marked loss of surface expression of the chemokine CCR7. This defect in CCR7 expression was confined to CD103+ DCs, as CCR7 expression on T lymphocytes was unaffected. Moreover, CCR7 was not induced on CD103+ DCs from Nr4a3-deficient mice in response to either administration of the TLR7 agonist R848 or infection with Citrobacter rodentium in vivo. The transcription factor FOXO1 has been shown to regulate CCR7 expression. We found that FOXO1 protein was reduced in Nr4a3-deficient DCs through an AKT-dependent mechanism. Further, we found a requirement for NR4A3 in the maintenance of homeostatic mitochondrial function in CD103+ DCs, although this is likely independent of the NR4A3/FOXO1/CCR7 axis in the regulation of DC migration. Thus, NR4A3 plays an important role in the regulation of CD103+ mDCs by regulating CCR7-dependent cell migration. Citation Information: J Clin Invest. 2016;126(12):4616-4625. https://doi.org/10.1172/JCI88069. Citation Information: J Clin Invest. 2016;126(12):4626-4639. https://doi.org/10.1172/JCI88606. Chronic inflammation in visceral adipose tissue (VAT) precipitates the development of cardiometabolic disorders. Although changes in T cell function associated with visceral obesity are thought to affect chronic VAT inflammation, the specific features of these changes remain elusive. Here, we have determined that a high-fat diet (HFD) caused a preferential increase and accumulation of CD44hiCD62LloCD4+ T cells that constitutively express PD-1 and CD153 in a B cell–dependent manner in VAT. These cells possessed characteristics of cellular senescence and showed a strong activation of Spp1 (encoding osteopontin [OPN]) in VAT. Upon T cell receptor stimulation, these T cells also produced large amounts of OPN in a PD-1–resistant manner in vitro. The features of CD153+PD-1+CD44hiCD4+ T cells were highly reminiscent of senescence-associated CD4+ T cells that normally increase with age. Adoptive transfer of CD153+PD-1+CD44hiCD4+ T cells from HFD-fed WT, but not Spp1-deficient, mice into the VAT of lean mice fed a normal diet recapitulated the essential features of VAT inflammation and insulin resistance. Our results demonstrate that a distinct CD153+PD-1+CD44hiCD4+ T cell population that accumulates in the VAT of HFD-fed obese mice causes VAT inflammation by producing large amounts of OPN. This finding suggests a link between visceral adiposity and immune aging. Citation Information: J Clin Invest. 2016;126(12):4654-4658. https://doi.org/10.1172/JCI90425. Citation Information: J Clin Invest. 2016;126(12):4659-4673. https://doi.org/10.1172/JCI86905. Citation Information: J Clin Invest. 2016;126(12):4674-4689. https://doi.org/10.1172/JCI86950. Hypertension is a leading risk factor for dementia, but the mechanisms underlying its damaging effects on the brain are poorly understood. Due to a lack of energy reserves, the brain relies on continuous delivery of blood flow to its active regions in accordance with their dynamic metabolic needs. Hypertension disrupts these vital regulatory mechanisms, leading to the neuronal dysfunction and damage underlying cognitive impairment. Elucidating the cellular bases of these impairments is essential for developing new therapies. Perivascular macrophages (PVMs) represent a distinct population of resident brain macrophages that serves key homeostatic roles but also has the potential to generate large amounts of reactive oxygen species (ROS). Here, we report that PVMs are critical in driving the alterations in neurovascular regulation and attendant cognitive impairment in mouse models of hypertension. This effect was mediated by an increase in blood-brain barrier permeability that allowed angiotensin II to enter the perivascular space and activate angiotensin type 1 receptors in PVMs, leading to production of ROS through the superoxide-producing enzyme NOX2. These findings unveil a pathogenic role of PVMs in the neurovascular and cognitive dysfunction associated with hypertension and identify these cells as a putative therapeutic target for diseases associated with cerebrovascular oxidative stress. Citation Information: J Clin Invest. 2016;126(12):4690-4701. https://doi.org/10.1172/JCI88590. MHC class I–associated peptides (MAPs) define the immune self for CD8+ T lymphocytes and are key targets of cancer immunosurveillance. Here, the goals of our work were to determine whether the entire set of protein-coding genes could generate MAPs and whether specific features influence the ability of discrete genes to generate MAPs. Using proteogenomics, we have identified 25,270 MAPs isolated from the B lymphocytes of 18 individuals who collectively expressed 27 high-frequency HLA-A,B allotypes. The entire MAP repertoire presented by these 27 allotypes covered only 10% of the exomic sequences expressed in B lymphocytes. Indeed, 41% of expressed protein-coding genes generated no MAPs, while 59% of genes generated up to 64 MAPs, often derived from adjacent regions and presented by different allotypes. We next identified several features of transcripts and proteins associated with efficient MAP production. From these data, we built a logistic regression model that predicts with good accuracy whether a gene generates MAPs. Our results show preferential selection of MAPs from a limited repertoire of proteins with distinctive features. The notion that the MHC class I immunopeptidome presents only a small fraction of the protein-coding genome for monitoring by the immune system has profound implications in autoimmunity and cancer immunology. Citation Information: J Clin Invest. 2016;126(12):4702-4715. https://doi.org/10.1172/JCI89031. Citation Information: J Clin Invest. 2016;126(12):4716-4722. https://doi.org/10.1172/JCI90893. Citation Information: J Clin Invest. 2016;126(12):4723-4726. https://doi.org/10.1172/JCI90140. Citation Information: J Clin Invest. 2016;126(12):4727-4734. https://doi.org/10.1172/JCI91578. Leptin is an adipose tissue hormone that functions as an afferent signal in a negative feedback loop that maintains homeostatic control of adipose tissue mass. This endocrine system thus serves a critical evolutionary function by protecting individuals from the risks associated with being too thin (starvation) or too obese (predation and temperature dysregulation). Mutations in leptin or its receptor cause massive obesity in mice and humans, and leptin can effectively treat obesity in leptin-deficient patients. Leptin acts on neurons in the hypothalamus and elsewhere to elicit its effects, and mutations that affect the function of this neural circuit cause Mendelian forms of obesity. Leptin levels fall during starvation and elicit adaptive responses in many other physiologic systems, the net effect of which is to reduce energy expenditure. These effects include cessation of menstruation, insulin resistance, alterations of immune function, and neuroendocrine dysfunction, among others. Some or all of these effects are also seen in patients with constitutively low leptin levels, such as occur in lipodystrophy. Leptin is an approved treatment for generalized lipodystrophy, a condition associated with severe metabolic disease, and has also shown potential for the treatment of other types of diabetes. In addition, leptin restores reproductive capacity and increases bone mineral density in patients with hypothalamic amenorrhea, an infertility syndrome in females. Most obese patients have high endogenous levels of leptin, in some instances as a result of mutations in the neural circuit on which leptin acts, though in most cases, the pathogenesis of leptin resistance is not known. Obese patients with leptin resistance show a variable response to exogenous leptin but may respond to a combination of leptin plus amylin. Overall, the identification of leptin has provided a framework for studying the pathogenesis of obesity in the general population, clarified the nature of the biologic response to starvation, and helped to advance our understanding of the neural mechanisms that control feeding. Citation Information: J Clin Invest. 2016;126(12):4735-4741. https://doi.org/10.1172/JCI91686.